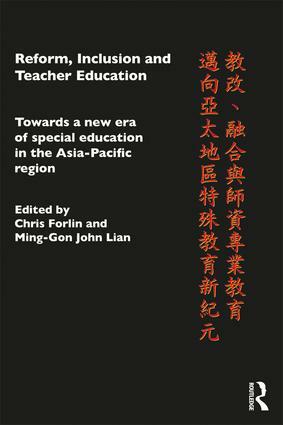 This ground-breaking book considers current perspectives on special education reform in the Asia-Pacific region. It has a major focus on a new era of special education, and how this relates to education reform towards inclusive education. "Education Reform in the Asia-Pacific region" reviews broad trends and issues in special education across the region, including Taiwan, Korea, Australia, India, China and Hong Kong. "Preparing Teachers to work in Inclusive Classrooms" focuses on curricula and pedagogical practices for teacher education. This section considers different approaches to preparing teachers such as cross-categorical, collaborative, innovations, and the impact of teachers’ attitudes, perceptions and concerns on inclusion. "Effective Special & Inclusive Practices" draws upon evidence–based research to provide best practice models to assist in developing inclusive school communities. Each section addresses a list of objectives and questions; suggests best practice pedagogy; and concludes with a support section with useful websites and suggested professional development activities. This book will interest teachers, teacher educators, university lecturers in education and post graduate students. Education reform for inclusion in the Asia-Pacific region: What about teacher education?